Sophie Gradden is a Contemporary artist, living & working in Windsor, Berkshire. Successfully completing her Art foundation in 2004 at the University of Gloucestshire going on to further her studies at Bristol UWE in a degree of Fine Art. Not completing her degree due to pursuing a career in interior design, her art skills were not lost, just tucked away for a while. 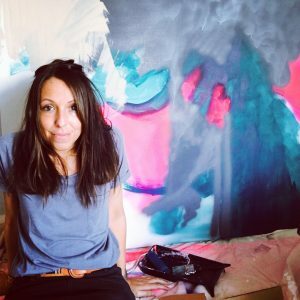 In 2016 Sophie reignited her love for painting and set up a makeshift studio in her home and began creating, whilst working full time. Exposing, for the first time, her artistic world to the public at Windsor Contemporary Art Fair. Since then, the art continues. In April 2018 a decision was made to dedicate herself to her art full time, no more 9-5, just painting, painting, painting and yep more painting! Inspired by personal life experiences, everchanging perspectives, architecture, symmetry, geometric shapes. Creating textures, layers, a juxtaposition of clean/ordered/solid with undefined/chaotic/broken areas. Bold striking colours, complimented by muted tones that capture the viewer. Preferring the medium of a Acrylic, Sophie also loves to experiment with household emulsions, spray paint, chalks and pastels.